Many years ago I stopped making New Years Resolutions. I was never able to stick to them and keep them going the year through. Not being able to keep up with such a lofty goal was frustrating. To say the least. And left me feeling defeated, not empowered. I began seeing Resolutions as Affirmations to Fail. What a negative and self-defeating concept. Setting yourself up to fail and feeling bad about not carrying through on the promise you made to yourself. How is this helpful? Well, for me it wasn’t helpful at all. So I stopped making Resolutions! Instead I worked on creating a motto to carry me through the rough patches of the year. The harder the challenge, the more blunt the Motto was. Especially in the beginning of my new practice. My first motto was designed to do nothing more than get me through a day of frustration and anger. In 2001 I didn’t like my Boss at the time, which meant I didn’t like my job either. But my Motto got me through those exceptionally rough days “I don’t care, I get paid.” And it worked. Pretty well actually. The group of people I managed at the time, took up my practice and new motto as well. Each time we hit a wall of frustration, someone would recite the motto and everyone would relax a little bit. This really hit home on the day we had spent 7 months working very hard on a project that was coming to a close. The scheduled date for completion was a mere 3 weeks away, but my team and I were less than 2 weeks from completion. Ahead of schedule and under budget! We were stressed by the work, but happy and proud of our accomplishment. One this particular afternoon we were called into a mandatory meeting with the Boss (which none of us liked) and his Boss. His Boss told us about a new approach the company was going to be taking and our project was going to be shelved on that very day. It was never going to be implemented, all the work we did was for nothing and everyone was extremely pissed off about it. Both Bosses tried to alleviate the anger in the room. But they didn’t get it. They didn’t really understand why everyone was upset. They knew the team had worked over time, at the expense of their families and they worked very hard at getting the project completed. But now, they were going to get nothing from the effort or from the accomplishment of making it ahead of schedule and under budget. I was angry too, until…..I remembered my Motto. I don’t care, I get paid. I stood up in the meeting and reminded everyone they were working on a project and getting paid for it at the same time. This wasn’t a project they weren’t going to get paid for if it didn’t get implemented. They got paid regardless. So in the long run, it’s no skin off our nose. We didn’t lose anything really. No reason to be upset, we got paid for nothing. Not bad if you look at it from a slightly different perspective. Of course I sweetened the deal by getting the bosses to agree to giving my team the rest of the week off as compensation for all the hard work and effort they put in to completing this project they were assigned. With pay, and without taking their vacation days to have the time off. Since this was a Tuesday afternoon, the rest of the week off was a nice incentive. The bosses boss said “It’s the least we can do”. That experience proved to me that the Motto idea was so much better than a Resolution. it was there when you needed it. It worked FOR you, instead of being a promise to yourself that you needed to work toward. It gave you support instead of making you feel as though you might fail in keeping your promise. A small difference in perspective can mean all the difference in the world. The Annual Motto was born from that initially frustrating afternoon through today. 15 years later, the Motto reaches a nice milestone. 15 years, wow. Doesn’t seem like it’s been that long. I raise a toast to the positive energy and inspiration each Motto has given through these past years. Each one was exactly what I needed to make it to the next New Years Celebration. 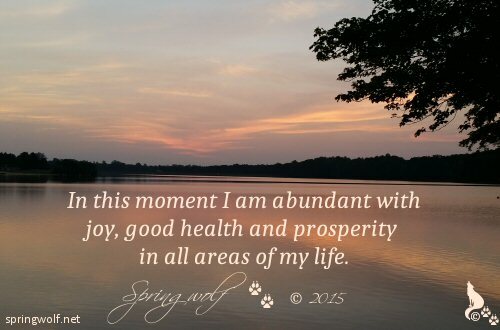 And I’m happy to share these annual affirmations with you. I hope they give you strength when you need it the most, and help you to take the next step when you feel like sitting down and giving up. May you all have a wonderful, prosperous and abundant New Year! If you’re interested, you can view all 15 annual Mottoes HERE on Reflections. Close loops. Create freely. Ship daily. And keep dancing down that spiritual path. Joy and abundance to you in 2015. Thanks for your contribution.